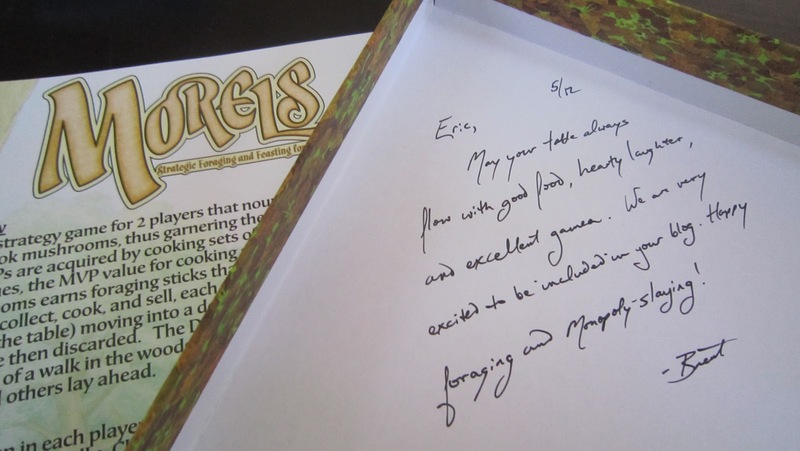 One of the highlights of the Origins game convention this year was picking up my signed copy of Morels directly from the designer himself. I'd read it compared to Jaipur and Lost Cities, two of the most enjoyable 2-player card games I know, so I placed a pre-order a few weeks before the con. Unfortunately for me, I've only been able to get in a few games just in recent weeks which is too bad as it's actually quite a lovely, beautifully-produced indy game that deserves a much wider audience. The rules of the game are relatively straightforward, much like most of the Kosmos 2-player line that inspired it, although there are few quirks that may take a practice game to wrap one's head around. In the abstract sense, this is a game of set collection a bit like Rummy but where the cards actually have a short window for you to grab them. In practice, though, the game is quite a thematic little ride of grabbing mushrooms before they rot and then cooking them for points or selling them to further one's opportunities. 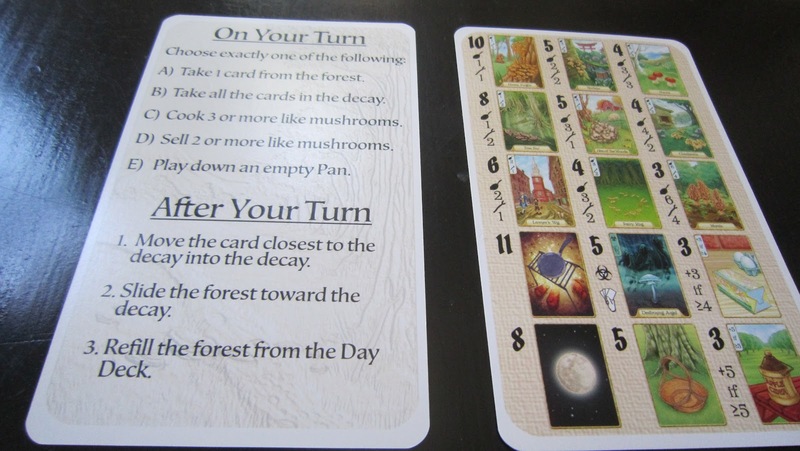 The mushrooms and other cards that players draw each turn are lined up in the forest from left to right with the two right-most cards being free and the increasing in cost the longer they'll be in the forest (or the farther left they are). 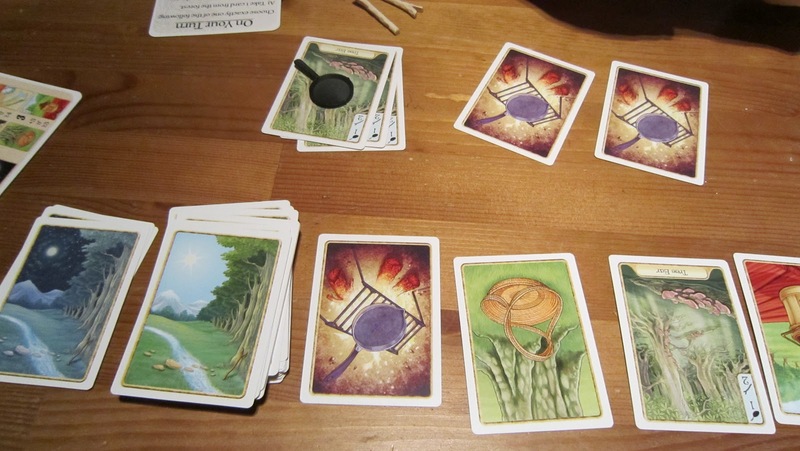 On most turns, a player will just take the simplest action which is to grab a single card from the forest. At the end of every turn, they then toss the right-most card into the decay and shift all the others in the forest down, adding one or two at the left. Players also have the option of drawing all the cards in the decay pile (possibly up to 4) but always need to adhere to the strict hand limit. And it's this hand limit that makes things a bit trickier. You need to save up at least 3 of the same kind of mushroom to cook them all at once but eventually after a drawing cards each turn, you'll hit the maximum and need to burn some cards. One option to help with this is to "sell" 2 or more of the same type for foraging sticks instead of cooking them for points. Now the sticks are what you can turn in to grab cards further into the forest instead of just from the two rightmost cards. And this leads to one of the many interesting decisions this game presents. Should I sell for sticks and more options later or should I wait and cook for the points that will win me the game? Simple but effective. That is mainly how the game plays although there are some special cards which keep things quite interesting. Butter and apple cider cards add bonus points to sets of mushrooms at the moment you cook them, pans are required for each set of mushrooms you cook, and baskets raise your hand limit allowing to you grab the decay pile more often, a BIG advantage. And of course there are the moon cards and the night deck, a very clever touch that adds opportunity with some risk. If a player grabs a moon card they immediately grab the top card of the night deck. The night deck includes one of almost every type of mushroom in the game but each night mushroom counts as two cards of that type. So one takes a chance with the mushroom they receive but are guaranteed to at least be able to sell it for sticks if nothing else. One final card, a poisonous mushroom called the Destroying Angel, can show up and hinder one's plays for a few turns. The main effect is that your hand limit drops to 4 (plus basket modifications) for a certain number of turns that are dependent on how many sets you've cooked so far. It can actually be a positive card if played right allowing one to discard some unwanted cards that you wouldn't have been able to toss otherwise. Unfortunately, the rules surrounding the Destroying Angel are a little hard to follow in the rulebook and we struggled a bit our first round. Also, the rules state that a player who is unlucky enough to be dealt a Destroying Angel at the beginning is basically stuck with a dead card until they pick up another Destroying Angel so they can discard it. This was a bit hard to explain to the first person I played the game with and seemed a bit unfair. In following games, we just chose to shuffle the DA's into the deck after both players had received their starting hands and this worked just fine. ﻿But setting minor rules quibbles aside, the game really does offer some interesting strategic decisions. Since the cards fly by so fast, a player must try to commit to certain sets of mushrooms. As in many great games, if you try to do too much, you really will succeed in very little. For example, should you try to collect 3 of the 4 rare Morels for a huge score or just get a bunch of Tree Ears and cook them in butter to increase the score? Even more interesting decisions involve when to grab foraging sticks instead of points and of course certain mushrooms offer many more foraging sticks. I've found myself in at least a couple games grabbing foraging sticks early in the hopes that I can scoop the rare Morels and Chanterelles before my opponent can reach them or they rot in the decay. The game is full of these meaningful but relaxed decisions and definitely benefits from multiple plays. If one could lodge any complaints, I would say that you will find yourself shifting cards down in the forest over and over and over. As well, the rules surrounding certain cards feel a tad involved for the lightness of the game, either that or they just aren't as clearly explained as I'd hope them to be. The game does feel a bit heavier than the elegantly simple Jaipur but all of the different cards do really add to the depth and theme without bogging it down. It's clear that this game was very well play-tested - from the touch of randomness and risk which I love in the Night deck and the Moon cards to the values of points versus sticks on the different mushrooms - everything seems to add choice and play value. 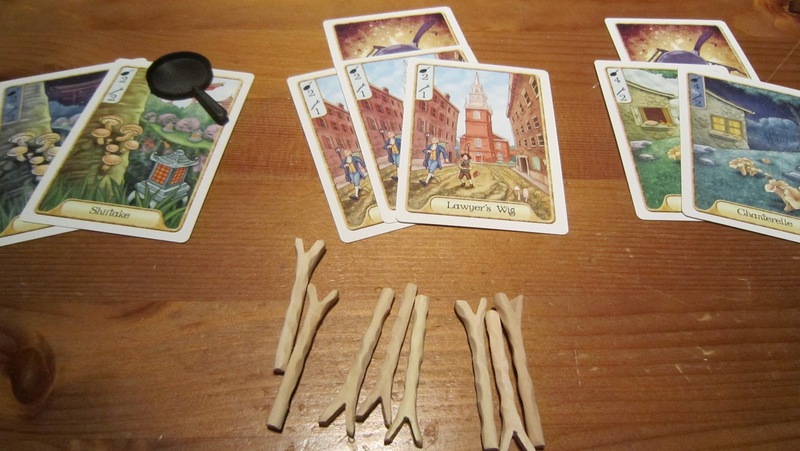 And the wonderfully illustrated cards and the handmade foraging sticks really do make this little game come alive. My signed copy. Awesome. Just awesome. 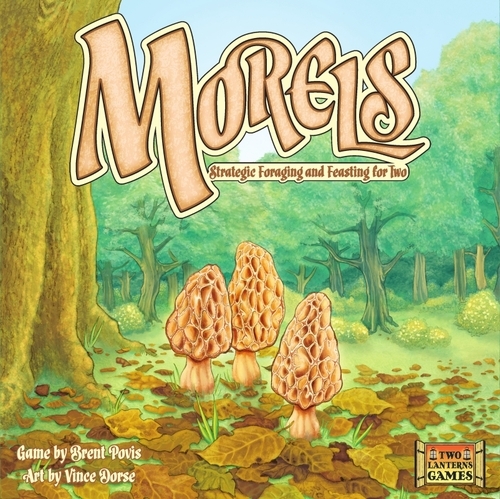 If you've had any interest in the Kosmos' 2-player line over the past years or are even just looking for a good couples games, I'd highly recommend Morels. It takes a game to get the hang of the different cards and how they work, but it is relaxing and fun and rewards multiple plays without ever feeling too heavy. And to top it off, it's a lovely, high-quality production from an independent designer who rightly deserves more recognition. And he's also a really nice guy who'll probably sign your copy, too, if you ask him nicely. You can check out Morels and even order it here. Highly recommended. I have to admit, from when you first featured this when you picked it up at Origins, I've been interested. The great review helps even more, and I'll definitely be ordering it. I'll probably end up getting the handmade extras, because it seems to add a nice touch. Your review for Friday was spot on, and I'm so glad I picked it up, so I'll take your advice again, and be buying this too. I love the idea of supporting a smaller game company as well! Yeah, this one's definitely a labour of love but it also happens to be a great little card game that my partner keeps asking me to play. That's always a good indication. Using RentalCars you can find cheap car hire at over 49000 international locations.